William Cheesman, a tailor, emigrated to SA in April 1849 on the barque ‘John Mitchell’ with his wife Frances and 6 young children aged from 3 to 11 years. They moved to Willunga where another child was born but died after 15 days. William initially worked as a tailor, but in July 1850 was appointed as the first Bailiff to the newly established Willunga Court which held hearings in the Bush Inn. The first Clerk of this Court was James Bassett who went on to set up a school which all six Cheesman children attended. It is said that William Cheesman when on Court duties rode around the district on his horse “Black Bess” a famous jumper of hedges and fences. William also acted as a spare coach driver when needed. Life in Willunga was not without its drama. In December 1850 Frances was ironing near the window when the curtains caught alight and fire spread to the thatched roof. Furniture was carried outside and half the house was saved after stripping the thatch off the roof. The family made their home at 9 St Andrews Terrace. From 1850 William and Francis were seat-holders at the first Willunga Wesleyan church. It was lit by candles and it was William’s duty to snuff the candles as needed during the service. He served as a Steward in the 1870s. William Cheesman is said to have introduced football to the colony of South Australia – he taught the young men of the district how to play, using a round football he brought with him from England. Tragically daughter Thirza Cheesman was drowned in a well in 1864 after suffering severe burns following an epileptic fit. Her mother Frances died in 1871 – the well-attended funeral service reflected the esteem in which she was held. James Bassett gave the Bible reading. William Cheesman died in 1876, aged 65 years, and is buried in the Willunga Methodist cemetery together with his wife Frances and four children. The family’s slate headstones, carved by George Sara, can be seen in the Willunga Slate Museum. Tragically, William's son Charles attended his father's funeral, even though he had the influenza. He had to sit in the coach in rain, both ways, and in consequence he died two weeks later, aged only 30 years. 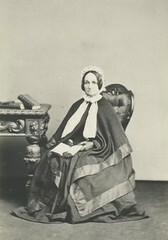 Frances Cheesman (Mrs William Cheesman) c 1860s. 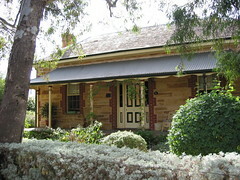 Cheesman home, Willunga, in 2005. Do you remember Cheesman, William ? Then Join up and add your memory here.